Avalon is a magical island, a place so special that anything it needs it produces of its own accord. A place where wealth can spring up in the form of jackpots from thin air? Quite possibly, which is why Microgaming has set sail there again with a sequel to its previous mobile slots outing, Avalon, that was a phenomenon in the early days of video slots. 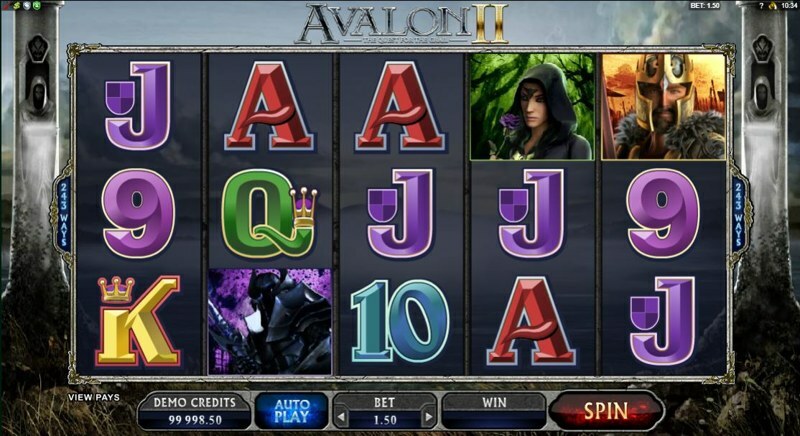 Avalon II is a five reel game with Microgaming’s trademarked 243 ways to win. There is no linked progressive jackpot to be pursued but there is a top in-game bonus of 120,000 coins waiting at the end of a single epic spin. Avalon II – The Quest for the Grail lays out the story with the title. Microgaming has rounded up King Arthur and his knights of the round table for this adventure. Think Camelot and Richard Harris rather than Monty Python and the Knights who say Ni. Legend has it that Arthur’s powerful sword, Excalibur, was founded on Avalon and it will play a crucial role in the quest. On hand to lend assistance in the quest is Guinevere the Queen, Morgana, the ruthlessly ambitious half-sister, and Merlin the magician. Also in the cast to muck things up is the Black Knight. Whenever the game symbols score a winning combination they spring to animated life, chief among them King Arthur slicing and dicing with his sword. Tis but a sideshow, however, to the bonus plays served up in Avalon II. Not all of those wins are bank busters. A pair of properly aligned Merlins and Arthurs, for instance, will pad your bankroll by a mere 20 percent of your wagered stake. Your quest in the kingdom can involve as many as eight possible bonus games. 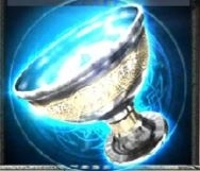 Most are triggered by the Holy Grail that plays the role of the Scatter in addition to being the object of acquisition lust. Each time three, four or five Grails appear anywhere on the reels you are moved to complete a stage of the quest (both Arthur’s and yours to pile up coins). The first bonus is the Lake of Legend where you toss a die ten times in an attempt to reforge Excalibur. If you successfully roll each number once the newly assembled sword will be complete and you earn 15X your total bet and receive 6X additional for each roll remaining. Next on the road to the grail is the Misty Vale Bonus which awards 15 free spins. Before the freebies get underway you can choose any character to be an extra Wild during the round which will double all subsequent prizes. The third time you hit the triggering Grails you will be asked to choose your path – either continue through the Whispering Woods for a Pick Me game with shields for a prize or go to the Forest Falls where 20 free spins are on tap with wilds that cascade down the reels. Your fourth quest is the Dusky Moors bonus where you must match helmets obscured by different cards. Two are golden and can return wealth beyond your wildest dreams. Bonus number five is another round of free spins from Morgan’s Keep, 20 this time with crumbling symbols. Each time a winning combination is fused the symbols responsible vanish and are replaced with new ones to offer more chances to win. Next up is the Hall of Shadows that demands a duel with the Black Knight. With each successful thrust prizes are won. The finale at the Avalon Bonus is a wheel spinning game to reveal your win. All the while the Avalon II Logo placard is Wild and so too is the Lady of the Lake. Although she only rises on the centre reel she expands to fill all three positions to enhance your chances for prizes. And that is how legends are made.